Official Nexus accessories are always exciting. Not just because we get to have cool new official toys for our phones, but because Google has such a bad reputation for releasing official accessories (remember that Nexus 10 dock from the holiday video last year?) that when one does become available, it's like a treat. 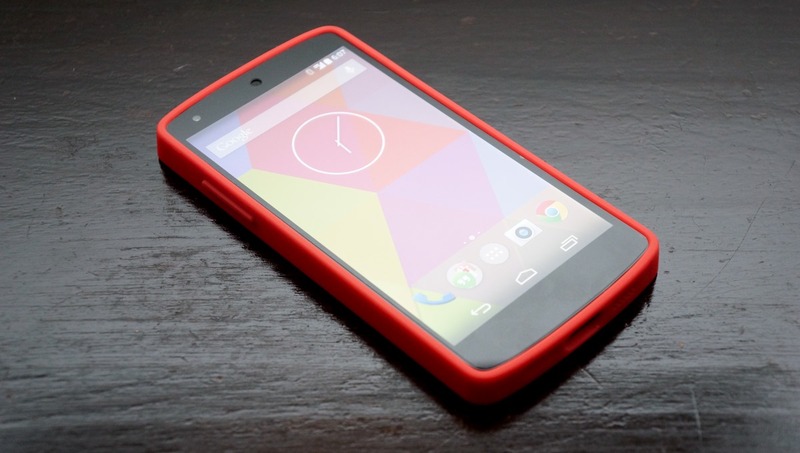 It is with this in mind that I approached the bright red version of the official Nexus 5 bumper case, and decided to give it a review. Coming into the experience, I didn't expect there to be much to discuss about the case, but it's - somewhat surprisingly - not a "this is exactly you expect" kind of situation. The first thing I noticed about the case was that it is not squishy. It's surprisingly rigid plastic, and takes not-insignificant effort to both put on and take off. That said, it feels sturdy, and the general presumption with phone cases is that they have the ability to protect your phone in some capacity. All of that said, the texture of the case is great. I have a hard time describing how the case feels when your fingers touch it, but I'd probably liken it to the Nexus 7 2013, with a slightly finer grain. It's super smooth, but just a teeny bit grippy. 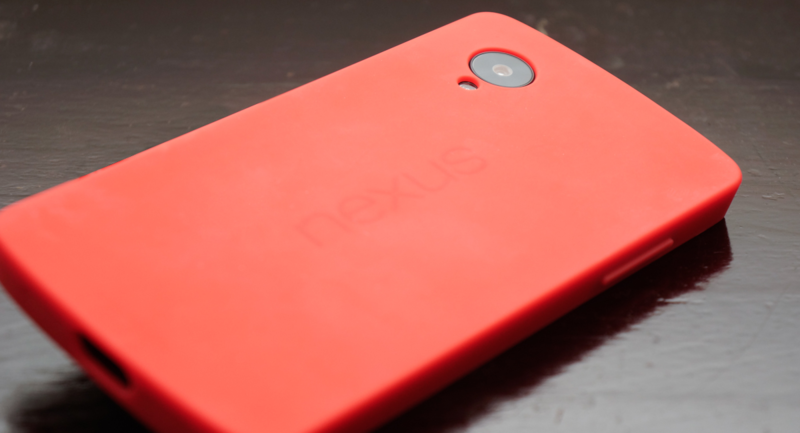 It's actually softer than the Nexus 5, if you can believe it. 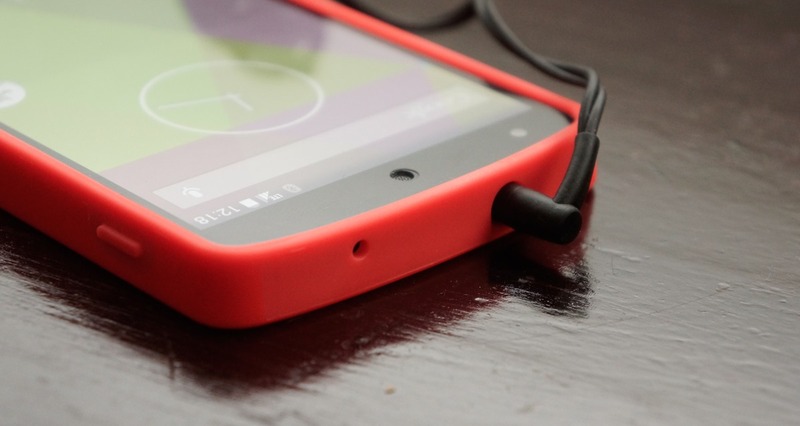 The only downside to its texture is the fact that it doesn't "stick" to the Nexus charging orb. Given that Google is peddling a new wireless charger for Nexus devices, though, I guess that isn't a huge problem. 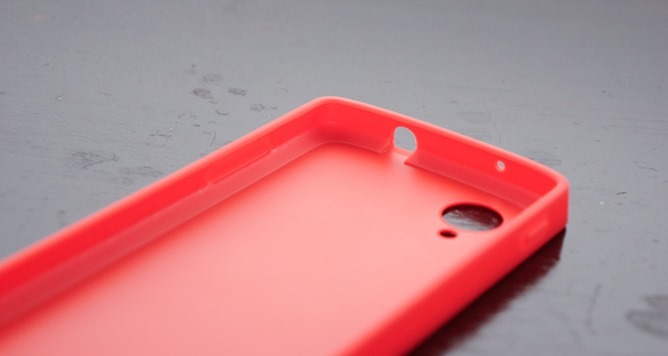 And the case does still allow the N5 to work with the orb, but only because the bottom of the case can rest against whatever surface the orb is sitting on. There's also a very subtle "nexus" logo printed on the back, mimicking the logo hiding on the phone underneath. It's very subtle, and the texture of the printing can barely be differentiated from the material under it. One thing to note is that the case has some nearly invisible, yet still noticeable ridges on the top and bottom edges. Whether this is because the case is thicker in some places than others (to accommodate port openings and the shape of the phone) I can't say, but they're there. Another minor quibble with the case's material is that it picks up moisture and oil quite easily. Eating a single potato chip and touching the case left a shiny smear. 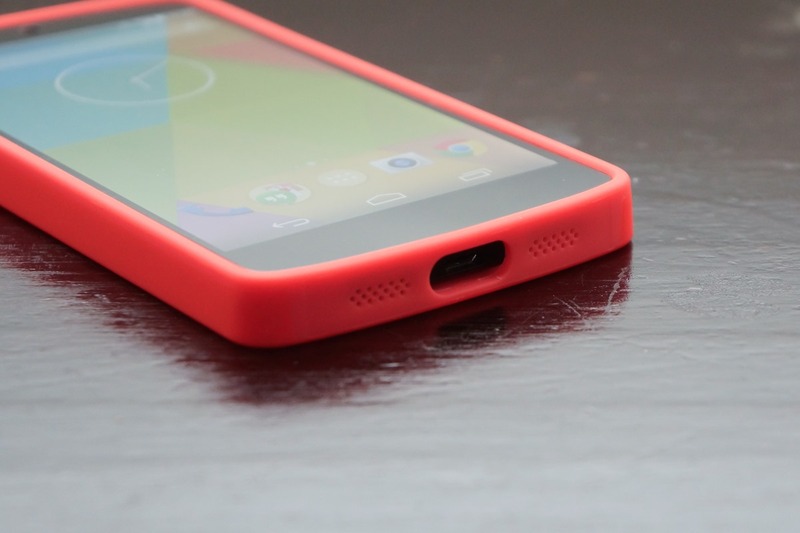 Speaking of the case's contours, there's a band around the inside that cradle's the Nexus 5's curved back. 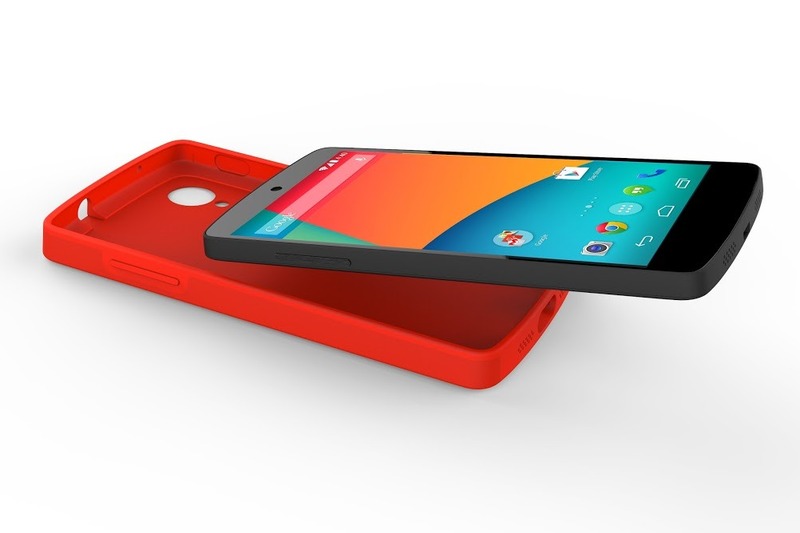 The approach Google took with the case is an interesting one, because it's clear that blocking off the curves that make the Nexus 5 such a pleasure to hold was a very deliberate move. 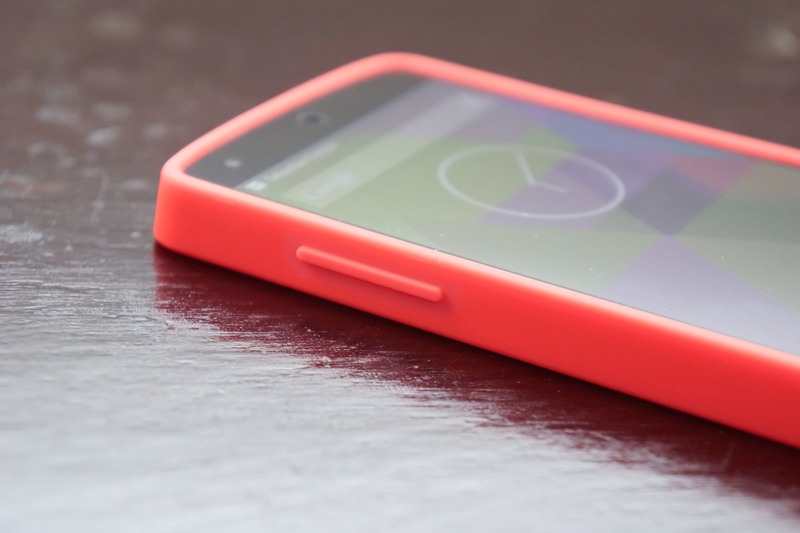 The lack of curves definitely makes a notable difference when using and holding the Nexus 5. The device feels more rigid and industrial, and all the finesse of the two-part curved chassis design is lost in angles. The bright side of this is that those whose hearts ache for the air hockey capabilities of the Nexus 4 will be at least partially satisfied with this case. 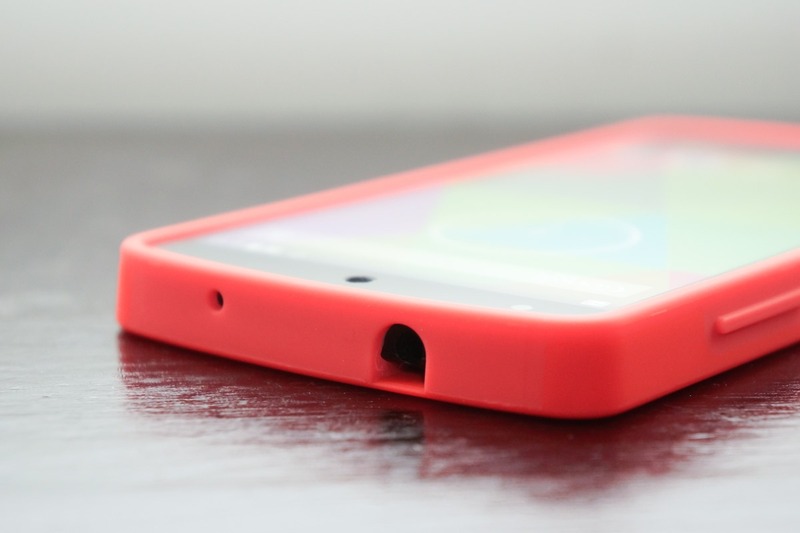 Angles aside, the real - and almost only - problem I have with this case is the buttons. They aren't clicky. On some level I knew before approaching the case that non-clicky buttons are a necessary evil of most plastic or TPU cases, but still - it's just no fun to press a button too hard without any kind of feedback except that the screen flicks on or the volume changes. If I press the buttons directly with my thumbnail I can feel the buttons clicking inside, but pressing them as I normally would feels wrong. It feels like I have to use more pressure than usual, with no feedback, and that the device just happens to react. The cover has thirty-seven holes. Thirty-two of those are earmarked by the bottom-firing speaker (singular) and its big fat phony counterpart, with one each going to the micro USB port, headphone jack, camera, flash, and top microphone. In theory, the speaker holes should line up perfectly with those on the actual device. In practice, there's pretty much no sound interference with the case, which is good. 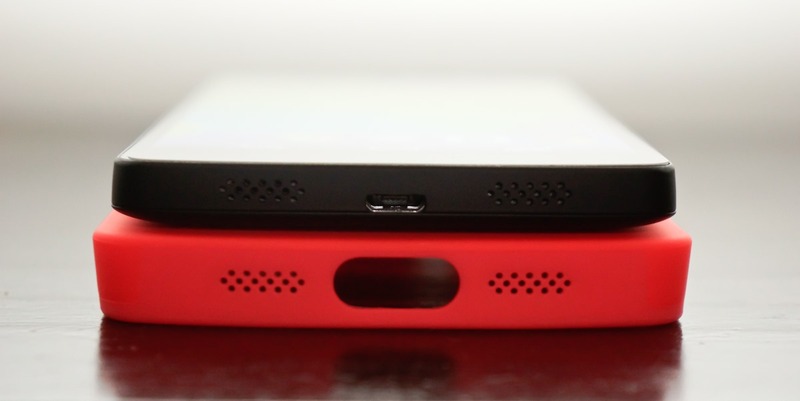 Past that, the two openings that really matter are the micro USB and headphone jack holes. 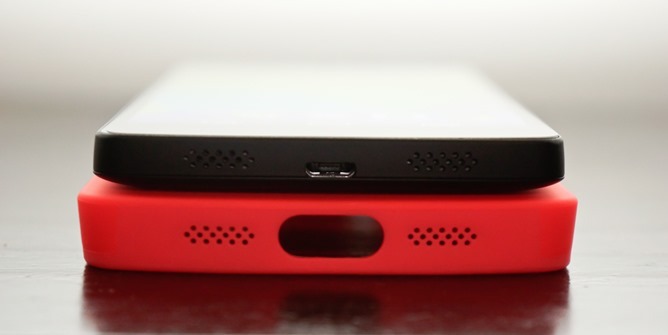 The micro USB hole is amply sized. You shouldn't have any problem plugging in your charger. The headphone jack can accommodate my earbuds with a fairly small connector, but the larger plug I typically use in the car just doesn't quite fit, which is disappointing. Then again, maybe I just need a cable with a smaller connector. Part of the reason my car-cable doesn't fit is likely that the opening is - like the rest of the case - angled, and doesn't stick closely to the curve of the case. With a headphone port that's already slightly less than a full circle on the N5, putting any more distance between it and the plug is bound to create problems. Is the case worth $35 plus shipping? As someone who very rarely uses a phone case, I wouldn't normally buy this case either. That said, it's nice for what it is. 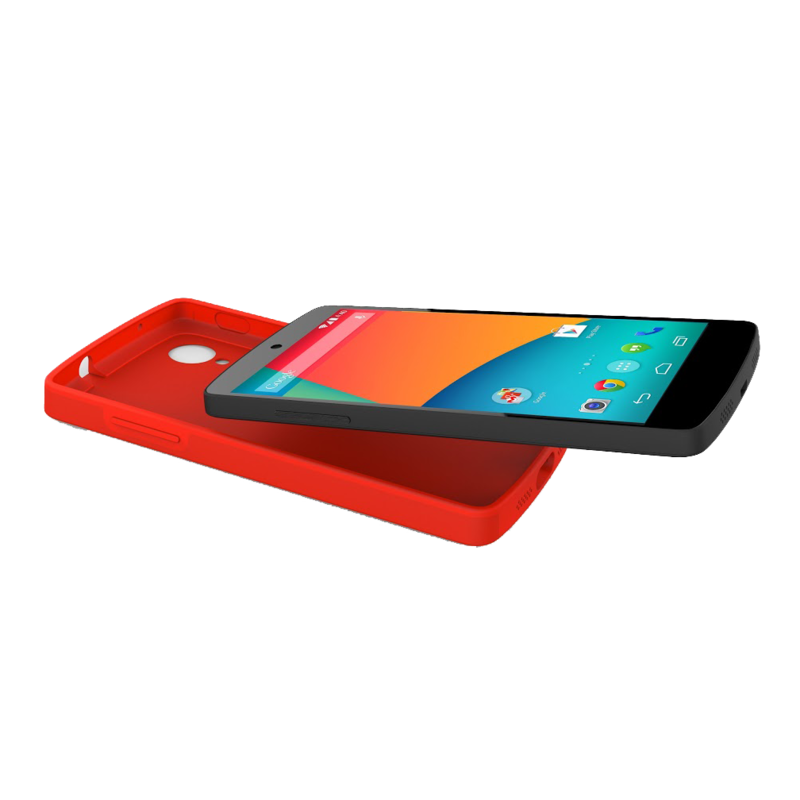 It has a great texture, looks fantastic, fits snugly, and at least gives the impression that it's offering your Nexus 5 some serious protection. Its major downfalls are the non-clicky buttons and a headphone port that's not compatible with every cable I own, but those used to cases like this will probably feel right at home. If, after reading this quick review, the case looks like something you want, you know what to do.